If your LFW pass got lost in the post (don't worry—we've all been there), then worry not, because we're here to bring you all the latest goings-on and front row action. When it comes to fashion week style inspo, we all know it's not only the runways that set the style agenda, but the stylish women pounding the pavements that will dictate what we wear in the coming months. 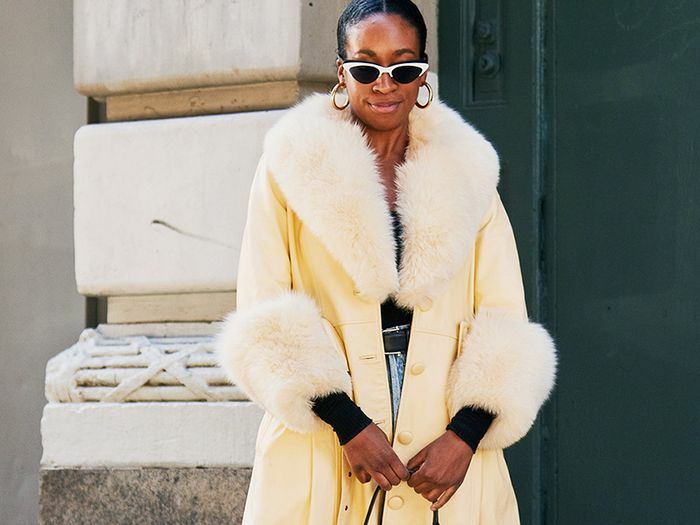 So, with that in mind, here is a round-up of all the best street style looks from this season—scroll down to see what the style set are wearing RN. 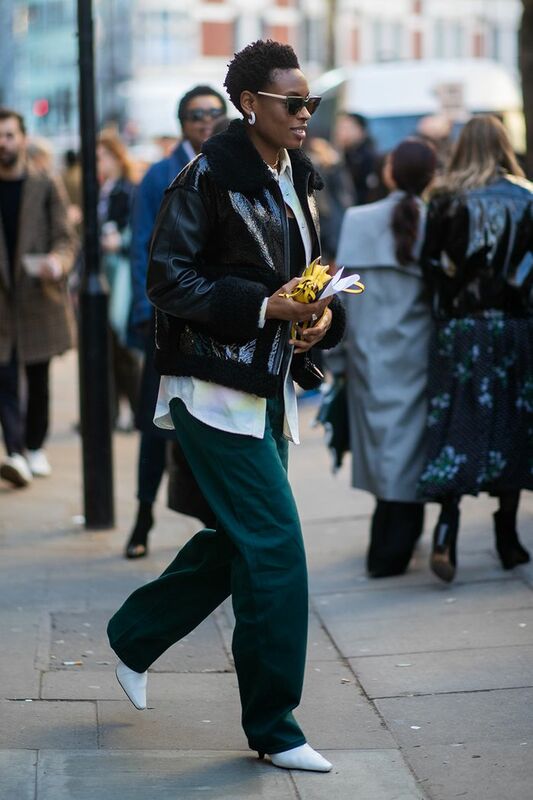 Style Notes: Donna Wallace embraces this season's coolest colour with a pair of green tailored trousers, which she styles with a patent aviator jacket. Style Notes: We've seen plenty of blazers so far at LFW, and this pinstripe number looks so cool with a pink maxi and trainers. Style Notes: One of our street style takeaways? A statement trench coat is a must-have for spring 2019. Style Notes: Beige, beige and more beige. If these showgoers are anything to go by, fashion's fave hue ain't going nowhere for A/W 19. Style Notes: Okay, this Topshop trench is everywhere right now. We love how this editor has worn hers with colour-match separates. Style Notes: A white tee, beige blazer and wide-leg leather trousers make for a minimalist's dream outfit. Style Notes: We're coming over all '70s with this flower-power frock. With voluminous sleeves and mega sunnies, this will be perfect for the summer months. Style Notes: We're really digging this colour combo: Tan brown and powder blue are the retro pairing that always looks expensive. Style Notes: If you're not feeling brights right now, take your cues from this earth-toned ensemble. We never thought summery white denim would work with tailored checks, but this showgoer proves us wrong. Style Notes: Puffa jackets have been our cold-weather saviour this winter, but they can work for spring when styled with bleached denim and a mesh top. Style Notes: Purple heaven. We can't get enough of this oversized shirt-slash-jacket, which hangs beautifully over a pair of tartan culottes. Style Notes: A sharp blazer makes for the perfect foil for a pretty gingham midi dress. Style Notes: Sometimes all you need is one statement coat. In Linda Tol's case, an oversized trench will do the job nicely. Style Notes: Yasmin Sewell rocks our favourite outfit combo: blazer, roll-neck, midi skirt and knee-high boots. Style Notes: It might not be the most practical getup in the world, but we predict zebra will be the print of the summer. Style Notes: This is pastel perfection. It can be tricky to style green, but this showgoer proves lilac and light yellow can work wonders. Style Notes: With her regal headband and flowing, belted dress, we think Florrie Thomas' outfit has more than a hint of Tudor royalty to it. Style Notes: Feminine florals plus luxe sportwear equals a high-low fashion fun. Style Notes: Now this is how you do tonal dressing in spring. Pale, butter yellow is set to take over from camel this year. Style Notes: We've seen plenty of mint green on the streets of London this season, and it makes for a chic pairing with snakeskin. Style Notes: We have so much time for Pandora Sykes's drawstring dress. Our takeaway: Pink, beige and white are a winning combo. Style Notes: A little more camel-coloured action for your viewing pleasure. It's so cool how Bettina Looney has layered her trench coat over a tonal suit. Style Notes: If you needed further convincing that hoodies can look stylish. Clearly the key is to layer under polished separates. Style Notes: All we want this season is a Kermit-green top by A.W.A.K.E. Linda Tol strikes sartorial gold yet again.